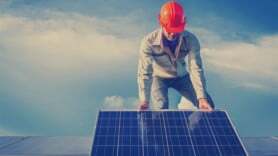 Solar power in the US has been given a boost with grants totalling $60 million (£37.2m) to drive affordable and efficient PV technologies. The US Department of Energy is providing the cash to local governments, universities and companies as part of its SunShot Initiative, which aims to spur innovation to reduce the cost of solar power. Around $16 million (£10m) will be given to projects seeking to boost cell efficiency and $12 million (£7.4m) will be spread among 17 solar technology and service companies. Utilities will get $8 million (£5m) to assist with integrating renewable energy into the grid. Energy Secretary Ernest Moniz said: “The tremendous growth in the US solar industry over the past few years is helping to pave the way to a cleaner, more sustainable energy future that protects our air and water and provides affordable clean energy to more and more Americans. The US solar industry employs around 119,000 people.